I have this vision that some day, I’ll have a back yard where I could curl up with a book (ok, a computer, or someday when I have the cash to throw around, an iPad). The reality is, I have two folding chairs and a tiny bistro table, where I stop to rest when working in the yard or playing with the pups. I think we’ve sat outside for a meal or to hang out less than 10 times, ever. How is that possible? Some day, that’s going to change. Maybe not this year. But it’s fun to dream. Last year Ikea had some garden chairs that were perfect. Soft, comfortable, with a retro grandma’s house vibe. 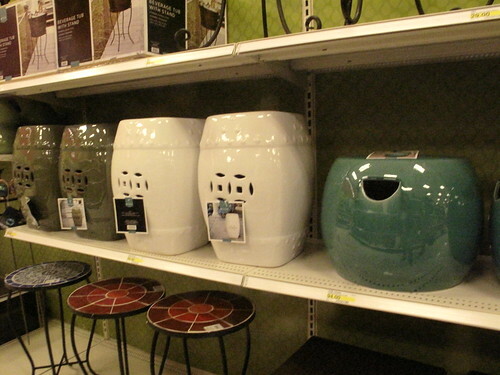 Oh, I wanted those chairs. But I had just been laid off and couldn’t responsibly get them, and then when I was back to full time work, they were gone. I hoped this year they would have them again. Sadly, no. 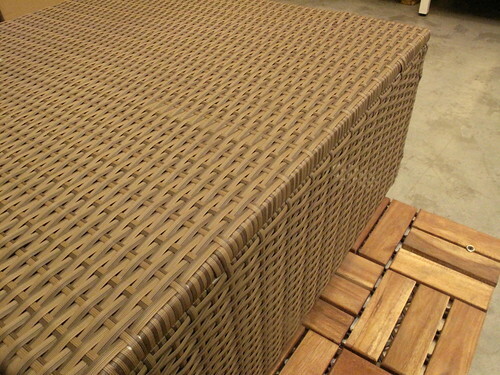 They did have a set of plastic-wicker pieces that you can use to configure a couch. I played around with them on polyvore to set up my room. I liked it on the computer, but once I got out there, they were smaller and lighter colored than I pictured them. 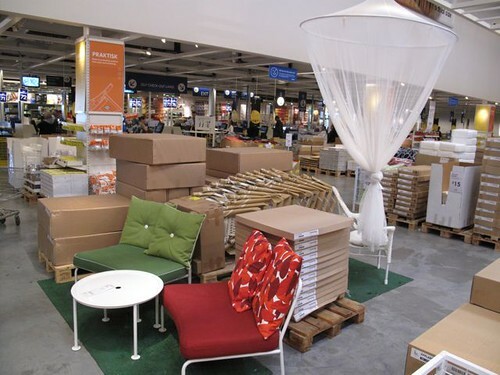 I liked this Ikea set better, although I’d want to replace the cushions with some much more substantial. Still, I’ve got my heart set on an outdoor couch. So much for super-bargain-prices, at least while looking online. Some more hunting, this time at Crate & Barrel, Z Gallerie, and Target. I had been looking at these white squarish garden stools at Target (strangely, I don’t see them on their website, only in the store), which are a bargain under $100, and one weekend, they were on sale for $67 (kicking self for not buying then). Of course now that I’ve seen the more expensive yellow stools, I’ve fallen for them. I’m not getting anything this spring, I have other priorities, but some day, I hope to be hanging out on my patio living room. < a green passerby… – Oh Joy! All of your polyvore rooms are beautiful…mentally superimposing them on that first (drop dead gorgeous) photo of your garden and it’s paradise. I’m sure your patience will be rewarded with the most fabulous furniture ever. Megan~~ I hope you won’t give up altogether. You could grab your creative potential and check the thrift stores now and then. 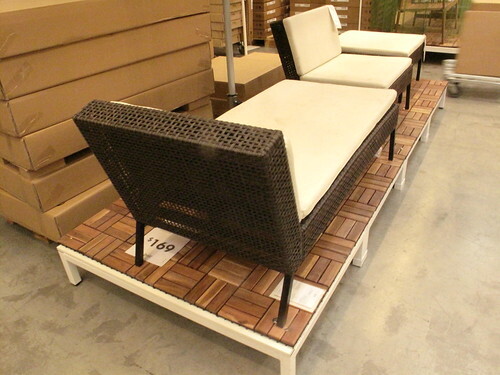 You never know if the right type of futon or garden furniture might make an appearance at just the time you are. A few years ago I decided I wanted a retro redwood chaise lounge. Not a new one but an old, circa 1960s version. Finding it wasn’t instant or an all-out quest but I just happened to be at a going out of business pseudo-half thrift store half garage sale and there it was $4.00. A little work with the hardware was needed and a pad from K-Mart’s Martha Stewart collection for $8.00 on clearance, and voila, naps during the too-hot-to-garden-afternoons. 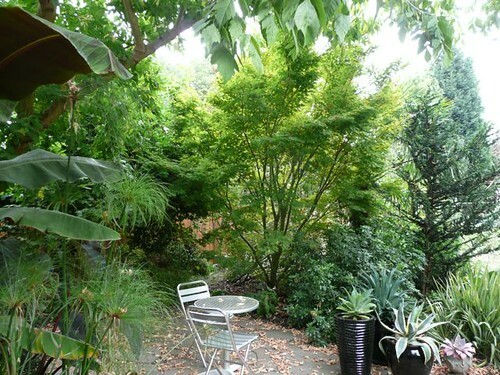 From this extremely enviable photo of your garden, I can see that you’ve got the perfect place for just such a find. Until then however I’m thinking that the bistro set is perfect for drinking in the morning coffee and sunshine. I could sit and study those plants all day. Just gorgeous. I hear you on this one, but I will say I’m making a real, decent seating area in my garden for the first time this year, and I regret not having done it before. As much as I’ve invested in plants for three years now, I wish I’d invested a bit more in a place to relax and enjoy them. There’s always Craigslist! And yard sales and flea markets! Also, do you know CB2, a cheaper, more mod Crate & Barrel brand? Good luck with it, regardless!